Chris Sacca (@Sacca) joined Tim Ferriss (@TFerriss) on The Tim Ferriss podcast to talk about investments, filters, influences and more. Sacca is the Proprietor of Lowercase capital and has been involved in early stage investments with Twitter, Uber, Instagram and many more. His interview is good not only for the professional stories about a venture capitalist’s thought processes, but also because of Sacca’s openness about life and mistakes. Many stories focus on the superhuman achievements and hero’s journey and we forget that life is about more than that. It’s about love, family, and whether we can make things better with what we’ve got. Let’s see how we can make things better. Sacca is a venture capitalist and a pretty good one. He’s worth over a billion dollars. He’s had this sort of success because he has models for what to invest in and what not to invest in. Models/heuristics/plans are something that many other guests on these digital pages have testified to. Peter Thiel looks for monopoly opportunity, otherwise he says no. Howard Marks asks what the future consequences are for a decision. Ramit Sethi suggests a system for our finances. Structure helps us make decisions. Sacca explains his own rule for investing. “Only get involved in deals where I can personally make an impact.” This is similar to what Mark Cuban says about his Shark Tank deals. “Start with something already great that you can make more awesome.” Sacca says that he always thinks he can make something better but he needs to harness the power of “no” in many of those cases. “Be proud of every deal.” There are a lot of ways to make money online, Sacca says, but you should only do the ones that you are proud of. “What’s the worst that can happen?” Sacca said that he missed out on a lot of deals (AirBnB) because he thought about worst case scenarios. In the interview with Ferriss he sounds a bit reluctant about these misses, but I think in the end it’s good. Let’s jump off this list and see why those missed deals are no big deal. 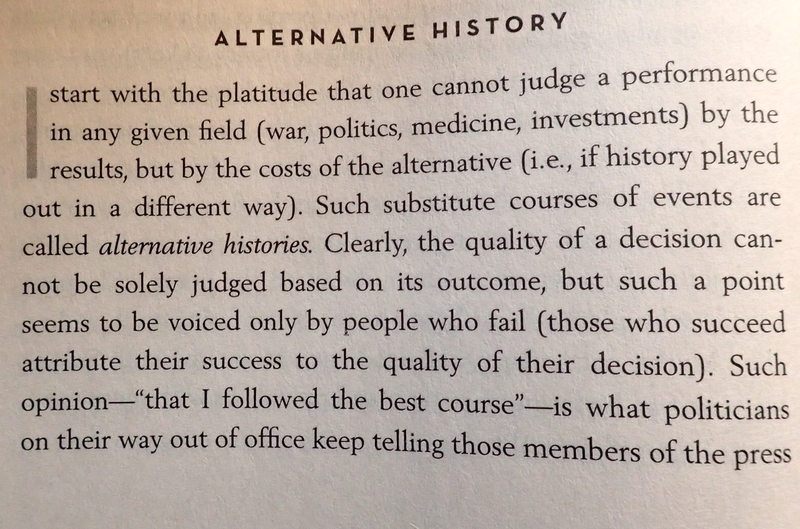 “I start with the platitude that one cannot judge a performance in any given field (war, politics, medicin, investments) by the results, but by the cost of the alternatives (i.e., if history played out in a different way). Such substitute courses of events are called alternative histories. Clearly, the quality of a decision cannot be solely based on its outcome, but such a point seems to be voiced only by people who fail (those who succeed attribute their success to the quality of their decision). Not the results, but the cost of the alternatives. Let’s look at this one. The biggest mistake anyone can make is to “blow up,” a permanent loss of capital (life). Taleb writes about it, Howard Marks talks about it, Ray Dalio wrote about it, Ferriss lives it. So, what might have happened with Sacca’s investments had he not been cautious? Could Twitter have gone to zero? Can Uber go to zero? Yes. And it’s not that hard to think about how. In 2006 when Twitter started there were already blogs, MySpace, and Facebook. If you wanted to share an idea (though not food pics, yet) you could. Twitter also began within SMS (text messages) limits. One year later the iPhone came out, two years later the “3G” version that brought data rather than SMS. Twitter – successfully so far – launched at the only possible time it could have. It’s not hard to think of other conditions that would have cratered that product. At the same time we can see how Uber might fall (or succeed). In his cautious approach then, Sacca may have found the only way to succeed. If he’s overly cautious, then he limits those companies that might go to zero. That’s the secret to investing (which Tony Robbins echoes in his book ). When talking about his investments, Sacca notes that he resisted investments in Uber and AirBnB because he thought that they might have scaling problems. Principally, someone might kill someone else in a car or rental. Two intriguing points are nestled into this one observation. Bill Simmons applies this filter to basketball and idiots. If you have one knucklehead on your basketball team, says Simmons, you’ll be fine. But if you double that number to two, you’ve increased your problems by more than twice as much. Now the knuckleheads have one another to hang out with. The opposite situation exists if you own pets. It’s takes some “investment of resources,” (time, money, learning, carpet cleaner) to own one dog. The second dog doesn’t double that. Sacca has mastered the nuances of scale and figured out where and how scale matters. My guess is that he saw how simple a product Twitter was, and realized how it might scale. He also saw how large AirBnB might become, but also saw the downside of that. “Someone who works at Walmart murdered someone last night,” Sacca tells Ferriss, as a way to make his point about scale. If you have that many people involved, someone will do something dumb. That Sacca chose “murder,” is telling because Sacca seems like a pretty happy guy. Why does he go right to murder? What’s happening here is the availability bias at play. Sacca said “murder,” because it was an easy example to come up with. He could have said drunk driving or breaking and entering (two acts more relevant to the talk about Uber and AirBnb) but he didn’t. Murder doesn’t matter as the example, but just to prove a larger point. He could have said something about a beach or party, both of which happened alongside the interview. The key takeaway is to recognize that we say things like murder, beach, or party because of a psychological trigger. If we can be aware of our mental shortcuts (not understanding scale as well as Sacca or overestimating something because of the availability bias) it can lead to better decisions. One aspect of modeling that anyone can start with right now is finding their “knockout questions.” Barry Ritholtz told Nick Murray that when they begin to converse with a client, they have questions that disqualify the clients from working with his team. These, you want a hedge fund, not a wealth management group questions work because they give up small short-term gains for long backend consequences. Banks do this. Van Halen did this. Sacca does this too. For his investments Sacca needs to see a founder that believes in the product unconditionally. It’s a red flag if, “in the pitch,” says Sacca, “the founder is trying to convince himself.” This statement made me wonder how Alex Blumberg got an investment, because it did not sound like this in the StartUp podcasts. Another knockout that Sacca uses is one that Peter Thiel also employees – don’t let initial use cases dissuade you. For Thiel this meant that even though Facebook was only for college students, it didn’t mean that it wouldn’t be used elsewhere. Gary Vaynerchuk uses this thought process when he speaks about new services. “Don’t dismiss something because it’s all beach body pictures,” instead look past that to see how it could be used better. For Sacca it meant seeing that Uber was more than a black car service for one percenters. Instead he saw a problem being solved. I would love to know why Sacca invested in Uber but not AirBnB. The companies seem so similar but one he passed on and one he didn’t. Was it just that Sacca was limited in time to investigate AirBnb? Was it a knockout question that led to a false negative? What Is My Upside? What is My Downside? Oh what a game Sacca has found to play. Venture capital investing is like going to a movie theatre on a hot day. You may end up seeing something great, but at the very least you are out of heat for a few hours. It’s a win-win situation. For Sacca that win-win means he gets paid a little if his investments blow up, (a no,no – see above) but he gets paid a lot if they go up. Sadly you and I are locked out of this opportunity because it’s only available to rich-silicon-valley-multiple-home owners. Ha, ha, no it’s not. We may not invest in Uber, but we have the power within us to create win-win situations everywhere in our lives. Chris Hadfield shows how to do this with our careers. If Hadfield wins big – he goes to space as an astronaut. If he “loses” he merely has a rewarding career that pays well and provides for his family. Andy Weir followed a similar plan. He enjoyed writing his book and put it online for free. That was his “downside.” The upside was that his book was turned into a movie with Matt Damon. Getting to Yes is the negotiation book that implores you to think win-win rather than zero sum. We can do this. What if you are dating someone? Create a win-win. What if you go to work and hate your job? Create a win-win. Become an intrapreneur and start to build more skills. MBA programs? A joke says Sacca. Law school? Ha, not worth your time. The opportunity to learn has never been better, it’s just in new places. Read Brad Feld’s Feld Thoughts or Josh Kopelman if you want to learn more about early stage investing, say Sacca. Sacca’s book suggestions include; Not Fade Away , How to Get Filthy Rich in Rising Asia , and I Seem to Be a Verb by Buckminster Fuller. Head over to Amazon, they are ready for your purchases. Another common attribute, Sacca says, is to have is the desire to learn. Evan Williams and Matt Mullenweg are always learning more by asking questions and reading books says Sacca. Reading books? Now where have I heard that before? There are some people in this world – we will call them “crazy” who only prefer the corner brownie. These people have even invented contraptions that allow them to bake all corner pieces. 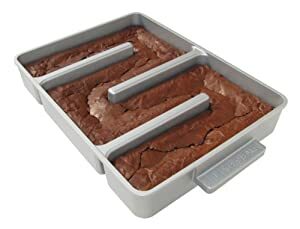 Why on earth you wouldn’t want a crumbling middle piece is beyond me, but if the crazies want to selectively slice and dice a sheet of brownies then more power to them. Bill Gates is like this to Chris Sacca. A man that he grew to dislike during his time at Google and whose antitrust work is dubious at best, Sacca saw a man he admired. Well, not a man, but a philanthropist. How does that jive, that you like one part of someone’s work but not the person? Take what you want suggests Sacca. He looked at Gate’s charity work and took those ideas to apply to his charity of choice, Charity Water. We can do this too. Select the best pieces (from articles like this) and use them. The rest, leave like the middle part of a brownie pan. The benefits of difficulty are nearly endless. Sacca weighs in and tells Ferriss about “sweet and sour summers.” Each year his parents would assign one fun or cool job (sweet) for the first part of the summer but then a construction job (sour) at the end. Peter Thiel said he looks for people who have done difficult but not impossible things. Rick Ross said growing up on the street taught him how hard he had to work. Neil Strauss said he only gets better when he leaves his comfort zone. Carol Leifer said her comedy only got better when she failed. Sacca tells Ferriss that he fled to Truckee California so he could “stop playing defense and start playing offense.” The problem was that as Sacca was more successful, more people wanted to spend time with him. “I was reacting to everything,” he tells Ferriss, so off he went. But not alone. Sacca’s family went with him (of course) but people came too. The only difference was that the right people came and they did so temporarily. His hot tub, (no I didn’t believe this at first either), is known as the Jam Tub and has a Foursquare checkin. Being away meant that Sacca had to invite people up to see him rather than people invite him for coffee. David Levien told James Altucher a similar story about his writing career. He was in Hollywood because he wanted to write movies. Guess what, Hollywood is distracting. Levien’s career only took off after he moved away from the parties, the industry, and the industry parties. I wrote these posts from rural Ohio, but it doesn’t matter. They start in the minds of someone like Gretchen Rubin or Astro Teller, filter through mine, and come to you. Location matters less and less, especially when it comes to ideas. I’m facing a big problem right now and I hope you can help. There are far too few women represented on this site. If you hear a good interview with a female thinker, leader, business owner, c-suiter, comedian, author, etc, please tweet or text me – 559-464-5393. Ferriss has talked with James Altucher twice, and you can find his notes here and here. // The photo is from Sacca’s talk with Pando Monthly. Reblogged this on Vendiendo humo desde 1983. In that role, among other responsibilities, he founded and headed up Google s Access division. His most visible projects include Google’s 700MHz and TV white spaces spectrum initiatives, the company’s groundbreaking data center in Oregon, and Google’s free citywide WiFi network in Mountain View, CA. Chris also spearheaded many of Google’s business development and M A transactions and was on the founding team of the company’s New Business Development organization.